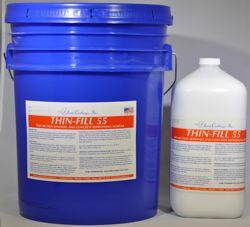 THIN-FILL 55 is a latex-modified reprofiling mortar for application of thin-section patches of 1/32 to 1/4 inch depth while maintaining excellent adhesion, strength, breathability and resistance to cracking.THIN-FILL 55 provides smooth finishes which can also be further polished to repair glazed terra cotta, smooth poured concrete or polished stone profiles. THIN-FILL 55 is a latex-modified reprofiling mortar for application of thin-section patches of 1/32 to 1/4 inch depth while maintaining excellent adhesion, strength, breathability and resistance to cracking. THIN-FILL 55 provides smooth finishes which can also be further polished to repair glazed terra cotta, smooth poured concrete or polished stone profiles. It can also be tooled after set to reproduce fluted profiles. THIN-FILL 55 test kits allow small-scale mock-up installation prior to larger volume purchases. Select from the list of standard colors or designate custom color (if known). Select proper grade to match substrate mechanical properties and composition. Dry Color Paks, produced in a THIN FILL 55 base, can be used for field tinting or adjustment or matching of colors. Thin Fill 55 Part A Liquid, reactive acrylic additive, is occasionally used at higher levels. Additional liquid can be ordered separately as needed.